In space during the joint Russian/American docking mission known as the ASTP the Apollo Commander and the Soyuz Commander make their historic handshake on July 17, 1975. 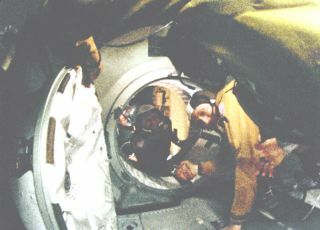 In this historical photo from the U.S. space agency, Apollo Commander, Astronaut Thomas P. Stafford (in foreground) and Soyuz Commander, Cosmonaut Alexei A. Leonov make their historic handshake in space during the joint Russian/American docking mission known as the ASTP, or Apollo Soyuz Test Project. The handshake took place after the hatch to the Universal Docking Adapter (UDA) was opened on July 7, 1975. Stafford is inside the UDA and Leonov is inside the Soyuz. The UDA was a specially designed docking module that was built by the United States that enabled the two spacecraft to link-up. It was attached to the Apollo Command Module during rendezvous and docking maneuvers. Once docking was complete, the module was pressurized. This grainy image was made from a frame of 16 millimeter motion picture film.